Free-living microorganisms may become suitable models for removal of heavy metals from polluted water bodies, sediments, and soils by using and enhancing their metal accumulating abilities. The available research data indicate that protists of the genus Euglena are a highly promising group of microorganisms to be used in bio-remediation of heavy metal-polluted aerobic and anaerobic acidic aquatic environments. This chapter analyzes the variety of biochemical mechanisms evolved in E. gracilis to resist, accumulate and remove heavy metals from the environment, being the most relevant those involving (1) adsorption to the external cell pellicle; (2) intracellular binding by glutathione and glutathione polymers, and their further compartmentalization as heavy metal-complexes into chloroplasts and mitochondria; (3) polyphosphate biosynthesis; and (4) secretion of organic acids. 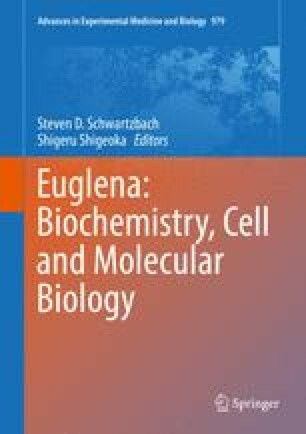 The available data at the transcriptional, kinetic and metabolic levels on these metabolic/cellular processes are herein reviewed and analyzed to provide mechanistic basis for developing genetically engineered Euglena cells that may have a greater removal and accumulating capacity for bioremediation and recycling of heavy metals. The present work was partially supported by grants from CONACyT-México (Nos. 107183, 239930, 178638 and 156969) and Instituto de Ciencia y Tecnología del Distrito Federal (No. PICS08-5) to SRE, RMS, ES and RJC.